There are some SUVs that come with a degree of rake from the factory, meaning the rear sits slightly higher than the front. This also happens when heavy aftermarket accessories are installed to the front – such as metal bumpers, bars, and winch accessories. There are leveling kits (different from a lift kit) designed to offset the height difference by introducing an adapter into the front suspension. 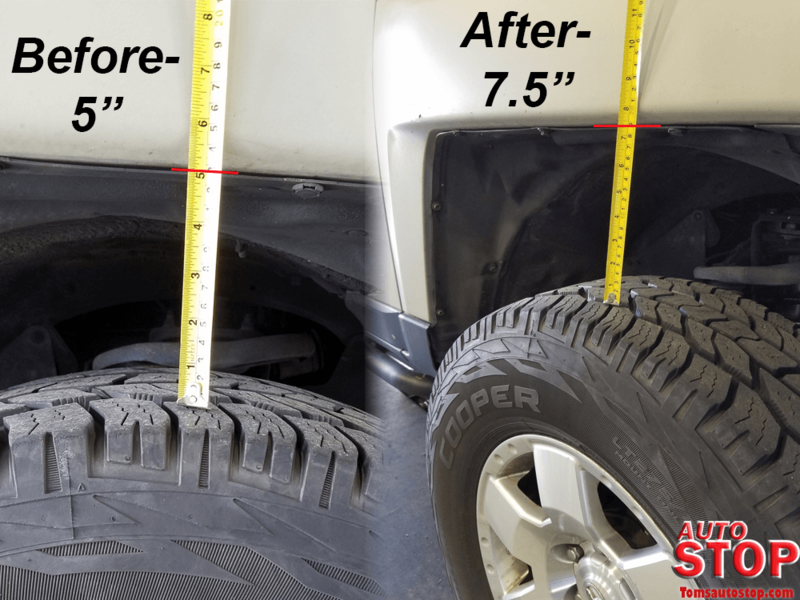 Pictured below is the front of an FJ Cruiser before and after we installed a leveling kit. The rear fender sits at 7.5 inches above the wheel, while the front fender was only 5 inches. 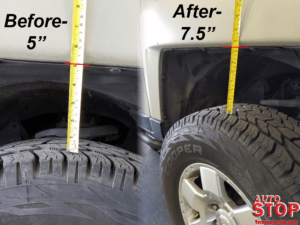 Once installed, you can see the same fender now measures 7.5 inches giving the vehicle a more level stance. Following a quick alignment, the FJ was back on (or maybe off) pavement!